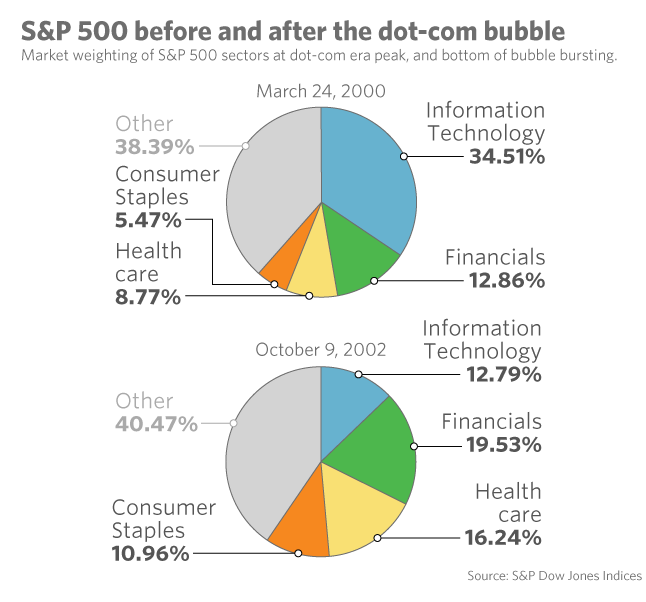 S&P vs. Dow Jones YTD….Tech is second largest sector in Dow at almost 17%. 2.The Low Volatility Stock Grab is Now Global….MSCI World Low Vol Trading at 21x Earnings. Investors have become extremely fond of stocks with low volatility and high dividends — perfectly understandable in a low-interest-rate environment. But have they gotten too fond of them? The MSCI World Minimum Volatility Index has gained 9.4% a year the past three years, versus 5.8% for the MSCI World Index. 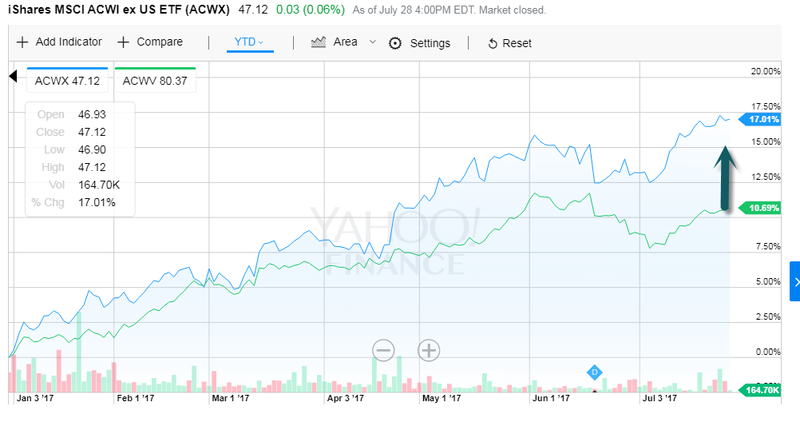 And at the same time, the average price-to-earnings ratio of the low-volatility index has risen to 21.2 — nearly the same as the World Index. 3.Libor…3 Month has Tripled Since the End of 2016. Most of the World’s Debt is Based on Libor. What it is: Libor—the London interbank offered rate benchmark—is supposed to measure the interest rates at which banks borrow from one another. It is based on data reported daily by banks. Other interest rate indexes, like the Euribor (euro interbank offered rate) and the Tibor (Tokyo interbank offered rate), function in a similar way. Why it’s important: Hundreds of trillions of dollars of securities and loans are linked to the Libor, including auto and home loans, according to the Commodity Futures Trading Commission. Even small movements—or inaccuracies—in the Libor affect investment returns and borrowing costs, for individuals, companies and professional investors. Catching up on reading this weekend, missed this story last week. U.K. regulator lays out five-year plan for alternative benchmarks to alternate benchmarks by the end of 2021. 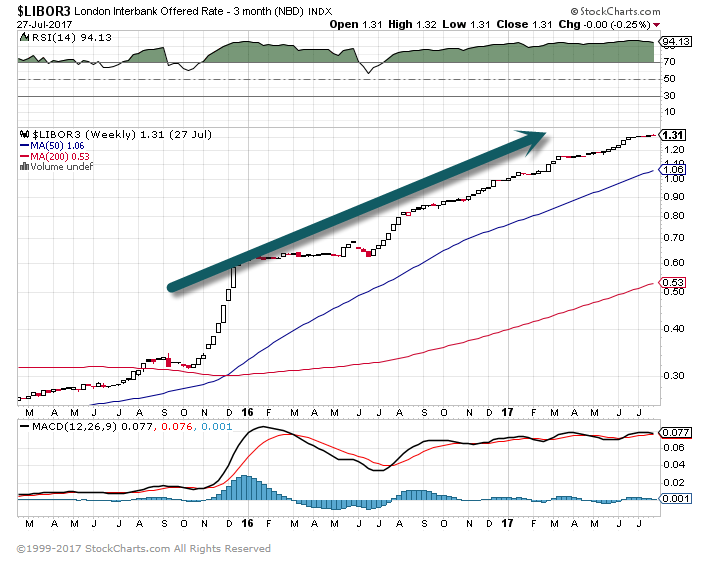 In five years, Libor could be no more. On Thursday, a top U.K. regulator said it would phase out the London interbank offered rate, a scandal-plagued benchmark that is used to set the price of trillions of dollars of loans and derivatives across the world. Andrew Bailey, the chief executive of the U.K.’s Financial Conduct Authority, which regulates Libor, said that work would begin to plan for a transition to alternate benchmarks by the end of 2021. “We do not think markets can rely on Libor continuing to be available indefinitely,” he said. Libor is calculated every working day by polling major banks on their estimated borrowing costs. Its integrity was called into question following a rate-rigging scandal where traders at numerous banks were able to nudge it up or down by submitting false data. Banks were fined billions of dollars and several traders were sent to prison. 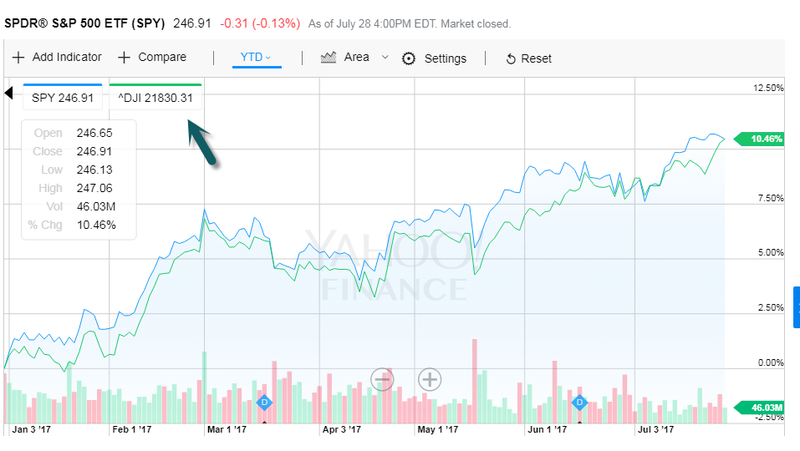 4.Stock Market vs. 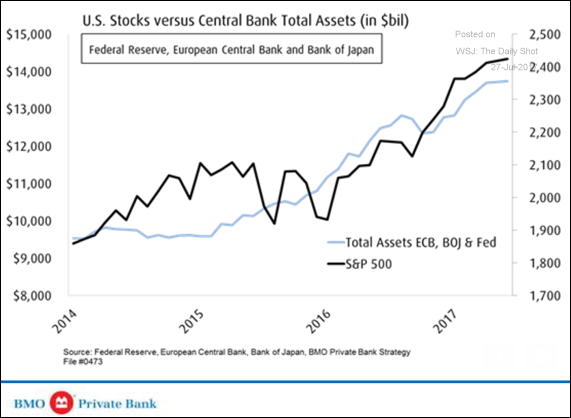 Global Central Bank Stimulus? Equity Markets: Some analysts remain convinced that the stock rally has been tightly linked to the total central bank stimulus. That doesn’t bode well for the market over the next couple of years. Watching 30Year ETF to see if it breaks thru 2016 lows…Will that be the beginning of secular rise in rates? 6.Private Client Cash Hit Record Lows this Year. private client cash levels have dropped to a record low as a percentage of total assets, according to data compiled by Bank of America Merrill Lynch. That means investors are feeling more emboldened than ever to put that money to work in the market. They’re choosing that over holding money on the sidelines — a risk-averse move typically associated with uncertainty. 7.AMZN Obsession….The Company was Mentioned in an incredible 10% of All Earnings Calls this Quarter…. 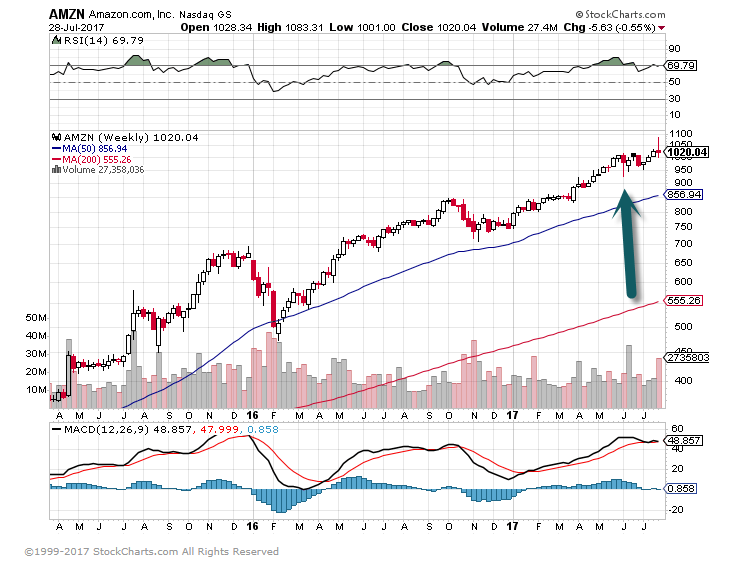 AMZN trading almost 100% above its 200day moving average. 8.See Energy/Commodity Bounce from Lows Last Week. Oil ETFs saw massive gains this week among the world of ETFs we track daily, with USO and DBO up almost 9% and 7%, respectively. 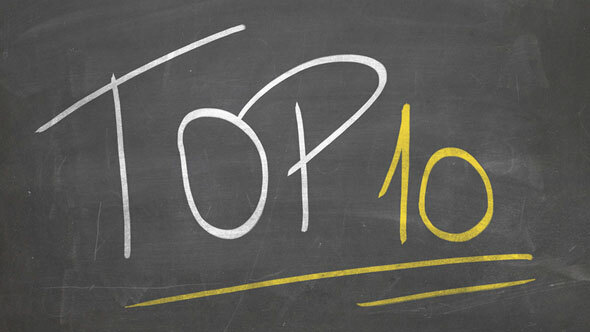 Energy also appears near the top of our list, appearing in the top 10 for the 3rd straight day. 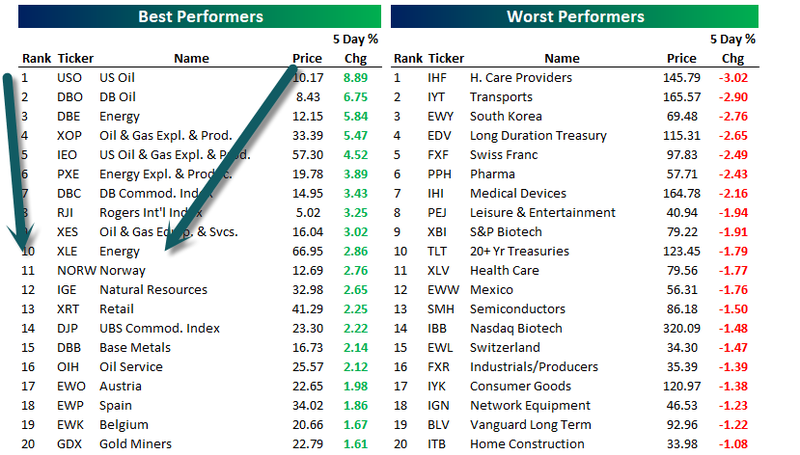 Natural Resources and Base Metals round out the list of other notable outperformers. Healthcare providers struggled, most likely a reaction to the Senate’s failure to pass their “skinny bill”. 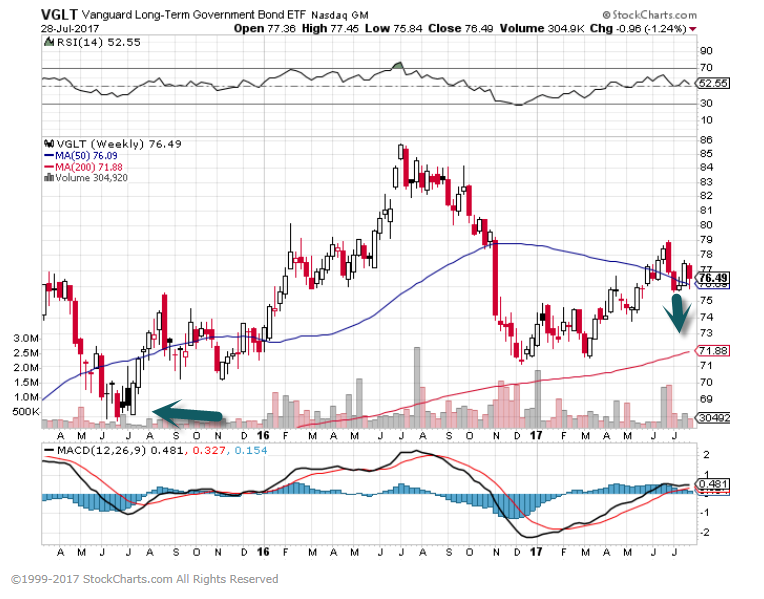 Transports and Pharma also continued their downward trend, down over 2%. 9.Read of the Day….Is Reversion to the Mean Finally Taking Place with College Tuition? Some schools are offering more discounts and cutting prices. U.S. college tuition is growing at the slowest pace in decades, following a nearly 400% rise over the past three decades that fueled middle class anxieties and a surge in student debt. Tuition at college and graduate school—after scholarships and grants are factored in—rose 1.9% in the year through June, broadly in line with overall inflation, Labor Department figures show. 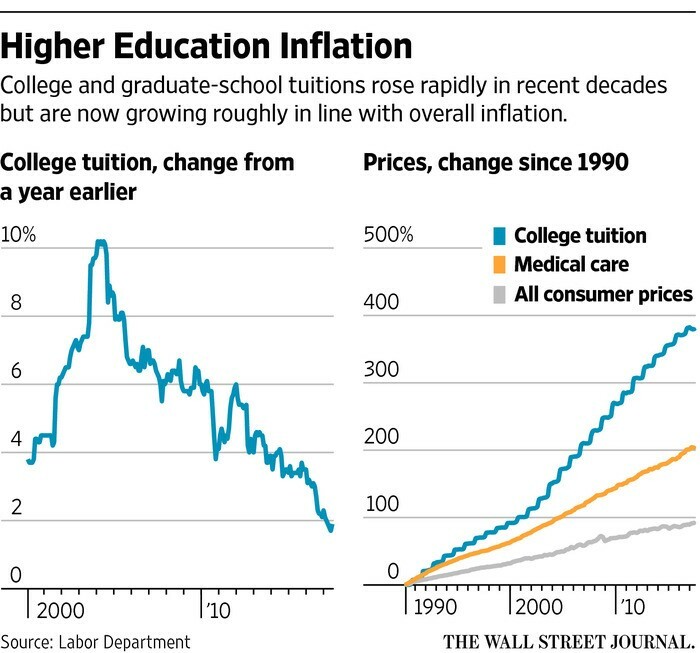 By contrast from 1990 through last year, tuition grew an average 6% a year, more than double the rate of inflation. In that time, the average annual cost for a four-year private college, including living expenses, rose 161% to about $27,500, according to the College Board. I’m asked about this all the time. These 11 tips work. 1. Deliver more positive than negative feedback. High-performing organizations deliver roughly five times as many positive statements (supportive, appreciative, encouraging) to every one negative statement (critical, disapproving, contradictory). This is because bad is stronger than good; our brains focus on negative feedback more than positive feedback. (You know this if you’ve ever had one bad conversation ruin your whole day.) Positive communication correlates with much higher worker engagement, our research suggests. You can correct your employees, even criticize or confront them, but you want to do so in a positive context. That is when you will see the best results and maintain morale and engagement. 2. Focus on communicating the other person’s strengths, unique contributions, and best-self demonstrations. Traditionally, we tend to focus on giving employees critical feedback. However, by focusing on their weaknesses, we only create competence. By focusing on their strengths, we create excellence. Be as specific about positive feedback as you are about negative feedback. We usually gloss over the strengths, mentioning them briefly, but then focus in much greater detail on the critical feedback. Remember to add examples and details to your positive feedback. Try to stay objective when you speak about the negative event. Describe the problematic situation (rather than evaluating it), identify objective consequences or your personal feelings associated with it (rather than placing blame); and suggest acceptable alternatives (rather than arguing about who is right or at fault). We deduce how someone is helping from their facial expression. Someone’s smile activates the smile muscles in your own face, while their frown activates your frown muscles, according to research by Ulf Dimberg. We internally register what another person is feeling by experiencing it in our own body. Smiling is so important to social interactions that we can discern whether someone is smiling even if we can’t see them. Your smile is thus something to think about even if you are delivering feedback over the phone. Smile appropriately to project warmth and goodwill. Research shows eyes really are the windows to the soul: You can predictably tell someone’s emotions from their gaze. Eye contact is the crucial first step for resonance, a term psychologists use to describe a person’s ability to read someone else’s emotions. It’s also important for creating a feeling of connection. Make and maintain eye contact when you’re giving someone feedback. From infancy, we are acutely aware of the voices of people we consider important, and the way we feel about another person shifts the way we speak. The tone of our voice, more than the words themselves, can give away how we feel. In fact, new research shows that we can often predict someone’s emotions from their voice. The way a person is sitting — slumped or sitting tall, arms open or crossed — transmits a message. When we walk into a room and find someone sitting with their arms crossed, we feel less connected to them. Having your chest open, arms uncrossed, making sure to keep nodding, smiling, and vocalizing (saying things like “mhmm” and “yes” in response to the other party) will help. Make sure you take on a non-dominant stance; after all, your role is already powerful. The best way for the other party to hear you is if you are not domineering. Research shows that the emotions we feel change the way that we breathe. You have probably noticed that when you’re stressed or angry you breathe quickly and shallowly, and when tired or exasperated you are more likely to sigh. Similarly, when we are with someone who sighs a lot, we may feel that they are annoyed at us. Before the conversation, try to take some deep, calming breaths. When you exhale, your heart rate and blood pressure decrease, so focus on breathing out longer than you breathe in. Doing this for a couple minutes before a meeting will help you start the meeting from a place of calm. That calmness will also help your interlocutor feel more at ease. Our mind wanders 50 percent of the time, research suggests. Moreover, given our busy schedules and the messages and emails that are popping onto our screens throughout the day, we sometimes are not present with the people in front of us: We’re still processing something that happened earlier, or we’re thinking about an article we just read or a phone conversation we just had. And the people you are talking to can tell. Because you are not fully present, you are less likely to hear them and respond to them skillfully, let alone understand where they are coming from. Despite all this advice, it’s critical that you be authentic, or your efforts will backfire. Just think of how you feel when you’re around someone who seems to be something they are not: We often walk away feeling uncomfortable or manipulated. Our blood pressure rises in the face of inauthenticity, according to research by James Gross at Stanford University. Rather than seeing the feedback situation as “work” or something you need to just get through, see the conversation as an opportunity to connect with another person who has their own needs and pain. Everyone, at some point, goes through tough times, sad times, painful times. By remembering the human experiences we all share, you will find that you are able to bring kindness and compassion into the conversation. If you are giving feedback, you will probe into what has prompted your employee to act a certain way, and you will find the right words to encourage a different type of behavior. Research shows that employees feel greater loyalty and are inspired to work harder for managers who are compassionate and kind.